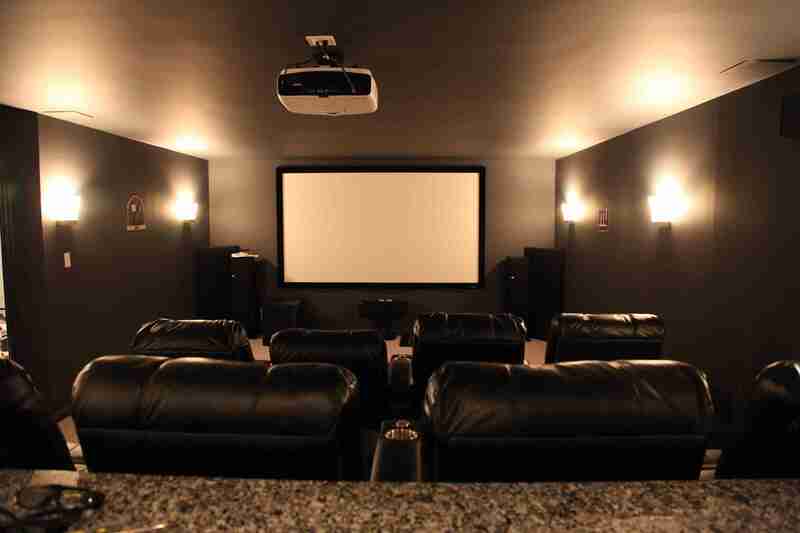 One of the advantages of a basement home theater is the ability to completely control the lighting; for a true cinema-like experience. But that creates another problem; do you stick with flatscreen technology, or really take advantage and invest in a projector? Projectors used to be exclusively found in boardrooms, classrooms and movie theaters – but now they’re making a big impact at home. Projecting a tiny image onto a blank wall, blowing it up in the process, they offer home cinema enthusiasts a true “big screen” experience. But many people still prefer to stick with more traditional technology, like a flatscreen TV. What is the difference? Flatscreen TVs have one major advantage over projectors – you can watch them practically anywhere. Projectors, by definition, require a darkened space to work effectively. You can stick your flatscreen in your front room, curtains drawn, and still get a great picture. But with great picture come great cost – and that’s where the advantages of a projector come in. Inch-per-inch, flatscreen TVs don’t come cheap; and you can buy a projector that blows up an image two or three times the size of a flatscreen for a fraction of the price. And the picture can be just as sharp. In fact, because of the slight diffusion effect, an image projected on a wall can sometimes look better than the equivalent image on a flatscreen. But your room needs to be dark to make that projection work; and just how dark can play a big part on the cost of your investment. The “power” of a projector is measured in lumens – this is how bright the projection is, and how strongly it will show up against natural light. In a front room, even with the curtains drawn, you’ll need to invest in a projector with 2,500 lumens or higher to get a picture that compares with a flatscreen. In a finished basement, however, it’s a different story. Because basements have very little natural light, you can actually invest in a projector with fewer lumens and still get an amazing image. Even if your basement is pretty light – with sunshine from a basement window well, for example – it’s much easier to cover up that light than the windows of a front room. And it makes a big difference. A mere 1,500 lumens projector works fine in a darkened basement; and will provide a cinema-quality picture that no flatscreen can come close to. That can mean serious cost-savings both in the initial purchase price, and running costs. 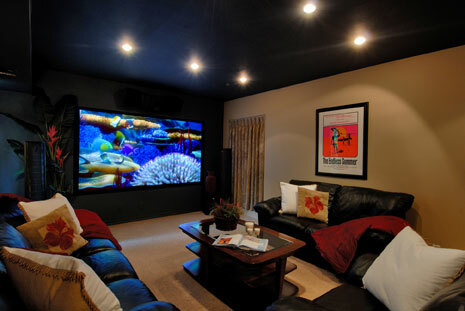 We’ll cover more details about choosing and installing a projector in a basement media room in future blog posts; but for the money, we’d certainly recommend considering one.